Beautiful single strand Pearl Necklace with Heart Pendant. 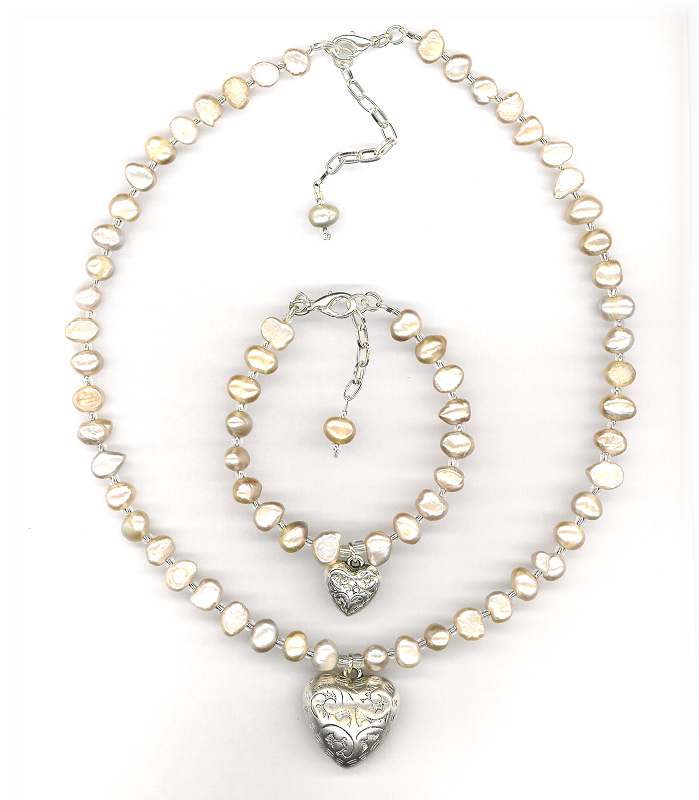 This Fresh Water Pearl Necklace is perfect for wedding jewelry or any classical necklace gift. We can on request custom make this necklace to any length. Our Fresh Water Pearl Necklaces are available in a single string, double string pearl necklace or triple string pearl necklace. The Heart pendant is an antique style heart made from a copper base dipped in silver Rhodium. The Pink Pearl Necklace length in this photo is our standard necklace length namely : 43cm or 18inch although it does have an additional extension chain added in case a little more adjustable length is preferred. Our Necklace extension chains are all 2 inches long. The Fresh Water Pearl Bracelet has a petite matching silver rhodium heart and is an excellent seller whether ordered on its own or in a set.